Canyon Ferry Lake: Water levels on the lake have improved and the pond is full so boat access is great now. Don’t hesitate to fish deep or cast or troll a Rapala in the shallows by the Duck Ponds. If you’re having a hard time finding some Walleye try trolling a crawling harness tipped with a leech behind a bottom bouncer and don’t hesitate to change up the depth. Late afternoon shallows along the shoreline has been very productive, as well. 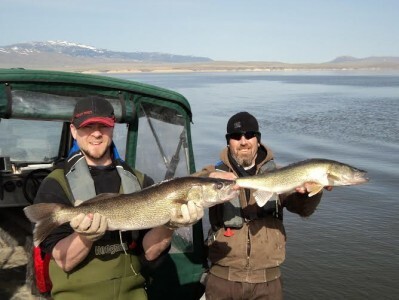 Holter Lake: Walleye are starting to get going out here. We recommend trolling with a crank or crawling harness tipped with a leech to find them. A couple of tips…make sure you change up your trolling depth until you start getting bites and for Holter keep to perch color patterns like Firetiger patterns for your cranks and crawling harness. Once you find them, jigging will be more effective so don’t hesitate to switch over once you’ve marked some fish. Trout fishing is also doing well, try trolling near southern shore near the damn with a down rigger and some cowbells or beercans with a spoon and crawler trailing behind. Hauser: Fishing is starting to pick up in Hauser and boat access open. Fishing has been pretty productive all around but, late afternoon shallows along the shoreline has been very productive. We’d recommend throwing some floating jigs tipped with a leech. Missouri River: Conditions wise, water flows are a little up again but on the downswing at 16k cfs and falling. Nymphing is the most productive in the mornings and by mid-day to early afternoon you might switch to dry flies if you see a few risers, who knows you might get lucky enough to find a brown looking for some surface action. For nymphing we’d recommend throwing PMD’s, Scuds, Caddis Pupas and some San Juan worms fish them longer and deeper with the current waterflows. If he you’re looking to throw some dry flies stick to the softer water near the shore line where you might catch a couple risers…the water is still running a little high so the fish won’t hang it on the surface where the water is pushing hard they’ll find quieter water and conserve some energy. Dry fly guys don’t fret things will really pick up once the flows drop more it’s the season right now we just need the river to play along. Streamer guys need to be looking to fish deep which means adding some sinking elements to your line, but the big streamers are catching fish well right now just make sure to get’em deep.